Majority of Turks living in East Turkistan are Sunni Muslims. Except for the areas where Hans are localised (especially in northern East Turkistan), Islam takes a major part in Daily life. The neighbouring network in Central Asia called 'mahalla' exists as an important basis of the life in East Turkistan. Various daily problems containing political, economical and social Issues have been settled by this kind of organisations historically. Centre of each mahalla has a mosque of the area and religious services are held every day. Large mosques in city centrals hold the religious services on every Friday. 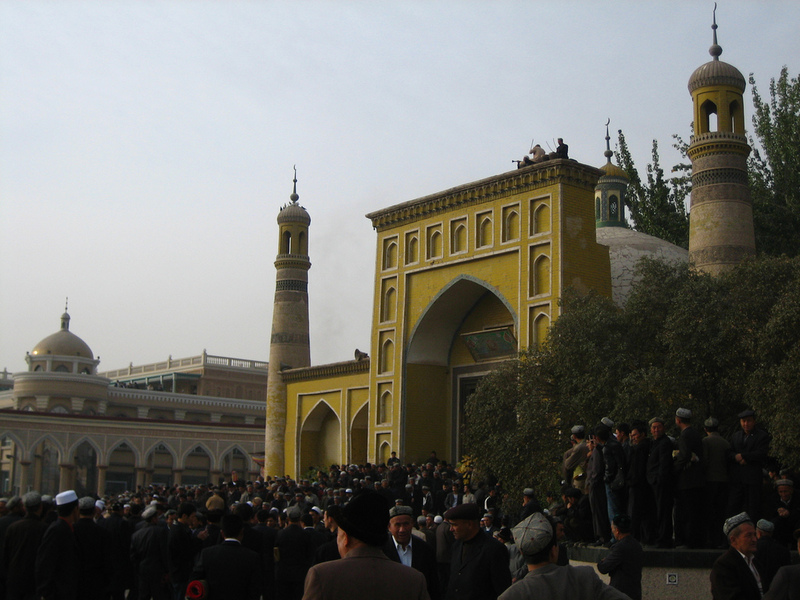 Apart from the common rituals of Islam, people in East Turkistan worship and make pilgrimages to mazaar (mausoleum of saints). from the fundamental Islamic view, the pilgrimages to mazaar is to be criticised as it is prohibited to embrace anything but Allah the only deity. However a number of people still make pilgrimages to mazaar and it shows the originality of the region. The largest mosque in this region is Id Kah Mosque in Kashgar. Since the establishment in 846 Islamic calendar (1422 AD), it has had several anastylosis and expansion and now it exists as an enormous temple with large estate property 140 metres from north to south, 120 metres from east to west, covering 1,500 square metres. The height of main gate with accurate patterns engraved is 12 metres and of the minarets of both left and right are 18 metres. Generally the mosque has 3 to 4 thousands of people praying inside and the number increases to 15 to 20 thousands on Fridays. On Roza Heyt (Eid ul-Fitr : Feast of the Breaking of the Fast) and Qurban Heyt (Eid ul-Adha : The Festival of Sacrifice), the number of people visiting there reaches 60 to 100 thousands. Abakh Khoja mazaar, the notably famous mazaar, is the tomb of Abakh Khoja, an Islamic clergy who took a part in Afaqis' activities and his family members (72 persons in 5 generation). It was built in 1670 and the first person entombed was Khoja Yusuf, father of Abakh Khoja. 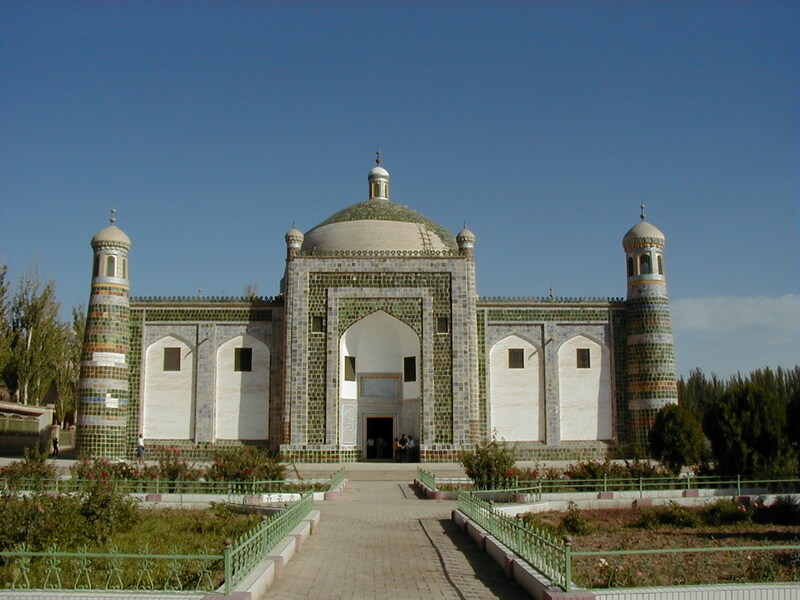 Having anastylosis and expansions, it was admitted to be a Central Asian Islamic tomb in 1874 and a mosque and related things were newly constructed. The building in which the coffins of the family members are placed has a green tiled- arch roof and 4 minarets on each corner. In addition, Chinese call this mazaar 'Grave of Fragrant concubine' as Iparhan (Fragrant concubine), one of the family member who became the Queen Consort of Qianlong Emperor, was entombed there. It is considered that Islamic law had been functioned partially in East Turkistan even being under governance of Qing's and Republic of China. However, after being governed by People's Republic of China, the Islamic law was banned and by exclusion of clergies and forfeiture of dedicated land from religious institutions, secularism of the society was forced through. After the Economic reform in People's Republic of China in 1980's, East Turkistan restored its Islamic status by the change of ethnic and religious policy. However since late 1980's, authorities have taken registration system for religious institutions and clergies to tighten the supervision. People in East Turkistan follow the 5 pillars and 6 beliefs of Islam and they also practice Islamic rituals of celebrating 2 biggest Islamic festivals. This festival is held on 1 October in Islamic calendar to celebrate the breaking of the fast of Ramadan (September in Islamic calendar). During the Fasting month, Muslims have a meal before the sunrise every day as they are not allowed to eat or drink during the day time. They can take food only after having a prayer of breaking fast and some water upon sunset. On the end of Ramadan, they celebrate the breaking of the fast and hold Roza Heyt. For the day, people clean the house and get festive dresses. females prepare various snacks and food while males prepare presents for the loved ones and they also prepare handset for children especially for the festa. In the morning of the festa, males gather at a mosque to attend the religious service of breaking of the fast. Then they visit ancestral graves, slaughter a cow or sheep and visit relatives and friends to share a joyous time. 70 days after Roza Heyt, 10 December in Islamic calendar, Muslims celebrate the Festival of Sacrifice. It is the biggest Islamic festival derived from the description on Quran. The brief summary of the description is as follows. Prophet Ibrahim was told to sacrifice his son, Ishmael, to Allah in his dream. When informed, Ishmael agreed to be sacrificed as it was Allah's will. Then the very moment Ibrahim attempted to kill his son, Allah sent an angel with a sheep and ordered Ibrahim to sacrifice the sheep instead of Ishmael. (In Judaism and Christianity, it is believed that it was Issac, the son of Abraham whom Abraham attempted to sacrifice. Issac is half brother of Ishmael). The festival of Sacrifice held on 10 December in Islamic calendar following the history above is Qurban Heyt. It is to be celebrated after completing the major process of pilgrimage to the holy city of Mecca, but it can be celebrated in one's local place if the situation does not allow him/he to do so. In the morning, people pray in festive dresses, visit family graves and then assemble in the mosque to pray. People greet each other there, go home to sacrifice a cow or sheep for the festival. The sacrificed is cooked to visitor and guests. On the day of Qurban Heyt, people visit not only the neighbouring friends and relatives but also the friends and relatives living in distant whom they do not see very often. People sing and dance with various musical instruments tremendously during the festive time.